Jake Libby’s composed century took centre-stage as the Nottinghamshire Academy maintained their stranglehold on their friendly against Lincolnshire MCCA Development. Libby’s 118 formed part of a 200-run partnership with Liam Patterson-White (101), as the game was started afresh for the second day after a commanding performance from the Academy on day one. 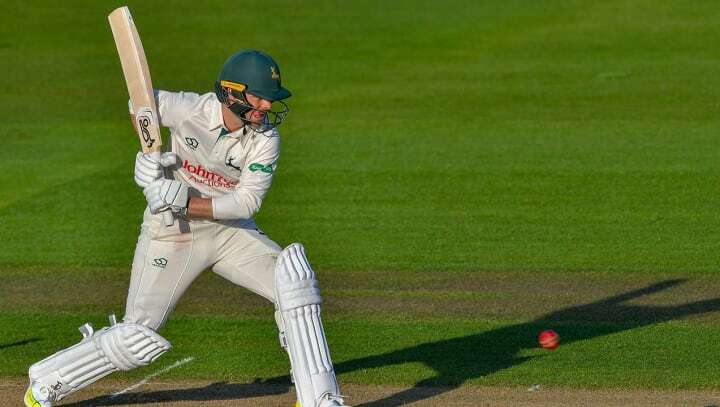 Lincolnshire began the second and final day in the middle, and made a strong start with a 50 partnership between the opening pair being brought up from just 62 balls. But Jack Timby (18) was removed soon after the landmark was reached, as he edged Joey Evison to Chris Gibson at second slip. This precipitated a collapse of the Lincolnshire batting order, with all ten wickets falling for 74 runs. Former Notts player Tom Keast (36) was next to go as the first of Lyndon James’ two victims, before Joey Evison induced a mistimed shot from his brother Sam, who was caught at mid-on for 6. James then snared his second victim of the game, knocking back Henry Wilson’s off stump for 11, and Jordan Cook and Matt Carter combined to see off Bilal Shafayat (5), facing the Academy side of his former county. Libby preceded his star turn with the bat with some quick thinking in the field, as his throw from point ran out Dan Freeman without scoring, with Lincolnshire rocking at 82-6. It then took a further seven overs for the Academy to make further headway, Joe Dobson (10) supporting a disciplined performance from Ben Coddington (24 not out) before he was removed by a smart catch from Callum Metcalf off the bowling of Jordan Cook. The Academy then brought Lincolnshire’s innings to an end soon after lunch, with Patterson-White removing Harry Franklin (1) and Nick Keast (1), either side of the dismissal of Mason Hildrith (6) by Nick Kimber for 6. The Academy’s reply got off to a rocky start as James was caught behind for 6, before Libby and Patterson-White’s partnership changed the complexion of the day. Libby was able to pick off the Lincolnshire bowlers, mixing defence with attack superbly in reaching his hundred off 128 balls before being stumped by Tom Keast for 118. Not to be overshadowed, Patterson-White compiled his own century off 142 balls before retiring on 101. Chris Gibson then took the initiative, opening his shoulders to make a 25-ball 35 in the company of Joey Evison (22), before time was called with the Academy on 297-3.